Who would have thought a camera in a mobile phone would bring down a household name? Longstanding business models, like Kodak, can’t assume that the way things have always been, is the way things will remain. In the same way, the longstanding ‘business model’ that is school education needs to look at the times and reinvent to be relevant for young people and provide the learning opportunities they need for a world outside school. One that is radically different from the default model many students experience. Education has always addressed the prevailing mood of society. While we may criticise industrial-era education today, at the time, it was responsive to the workplace and practices of the day. The Industrial era was a time of unprecedented population growth, with a shift toward machine-based manufacturing. Then in the post-war period the growing population was experiencing increasing personal income, resulting in increasing consumerism. People wanted stuff, stuff needed to be provided. In this culture, people were colloquially referred to as cogs in the machine. They worked hard for a day’s pay. There was little input, opportunity to contribute ideas or collaborate. People may have worked side-by-side, but each were specifically attending to their own duties. They started work at the whistle, they clocked on and then ended work with the whistle, they clocked off. The boss told them what to do and when to do it. As a result, the school system as we know it emerged. It reflected the society and prepared young people with the skills required and the associated social norms, including the idea that work was the means of supporting your family, paying bills and keeping busy. The idea of self-expression through work was sheer fantasy! 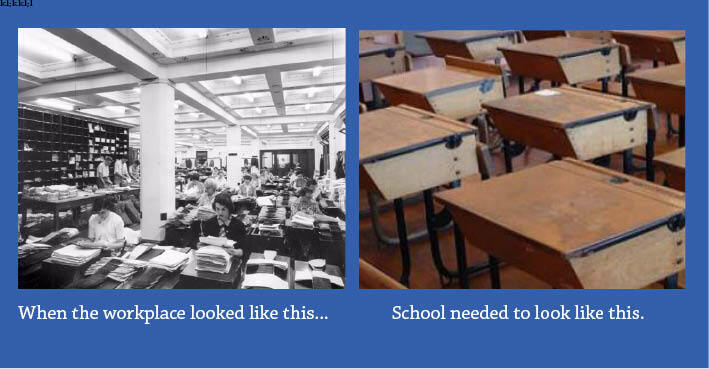 Work was compartmentalised and school moved the same way. Educators are pioneers and navigate unchartered territory and have done throughout history. The industrial-era school was a response to what the community needed at the time. Moving away from the agriculturally based society to an urbanised industrial society, education provided skills and routine. This isn’t the predominant model of the workplace, today. Increasingly in the developed world, employees are considered the most valuable resource, not just cog in a machine and they genuinely have a voice in how business works. Tony Wagner, in his book The Global Achievement Gap, outlined seven skills that the business sector has identified as necessary for survival in the knowledge age. …to then adapt and thrive in an environment of choice, creativity and collaboration?